Diggin’ Your Dog is an old school, down to earth, grassroots company owned and operated by people who truly “dig your DOG”! We rigorously source the best raw materials in each of our handcrafted products so you will feel safe and confident feeding our products to your pet.Consumers should be conscious about what they buy for their pets. There are many choices for the discerning pet owner in today’s highly competitive pet food industry. There are also many choices that the food/treat companies can make when manufacturing products that ultimately end up in the mouths of your companions.YOU GET WHAT YOU PAY FOR, YOUR BEST FRIEND DESERVES THE BEST!Diggin’ Your Dog has simply made the best choices available at each step of developing our very healthy, effective and easy-to-understand handcrafted and hand packed treats and supplements. We will not compromise quality for margins, trade safety for cost, or use any confusing marketing tools to win consumers. What you see is what you get… and what you get from us is the best.The founders of Diggin’ Your Dog and Super Snouts have spent upwards of 20 years in the retail sector of the pet industry. 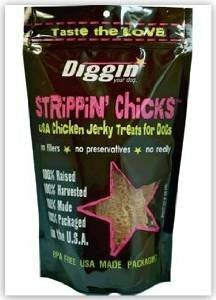 We have seen it all… from slop to super premium, marketing schemes to create intentional consumer confusion, and the kiss of death (literally), non domestic low grade material sourcing.You will never see any fillers, preservatives, confusing ingredients or synthetic materials in our products. We will not use delusive marketing tricks to get your purchase. We have done the detailed homework… so you don’t have to.WHY? BECAUSE WE DIG YOUR DOG! Finally! Dehydrated Pumpkin! No more cans! No more waste!... just add water. 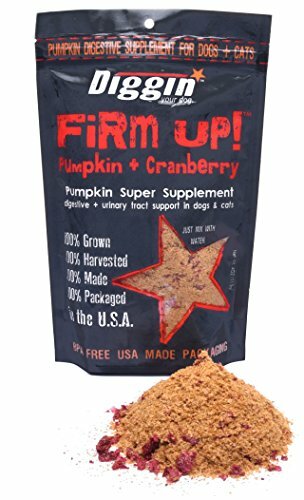 FiRM UP!+ Cranberry not only slows down your pets ride on the “Hershey Highway", it provides urinary tract support as well. Firm Up Anti-Diarrheal. 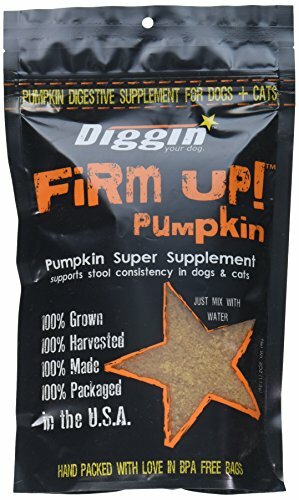 Pumpkin + Apple Fiber for digestive support in dogs and cats. Antioxidant rich blend to support healthy digestion. 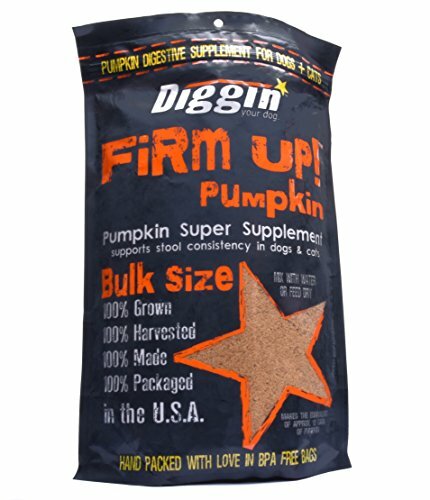 One 4oz bag will mix with water to make over 35oz of supplement. No more cans of pumpkin that go to waste in the fridge. Use what you need when you need it. Great for travel. Firm Up. supports regularity, happiness and health in your pet. Firm Up. was created because we "dig" your pet... and your carpet. Firm Up. is 100-percent grown, harvested, made and packaged in the USA... it is also packaged in BPA free resalable pouches that are made in the USA. Can be fed wet or dry To feed dry simply add one dose to feedings once a day. To feed wet, simply mix one part Firm Up. to one part water and add to feedings once a day. 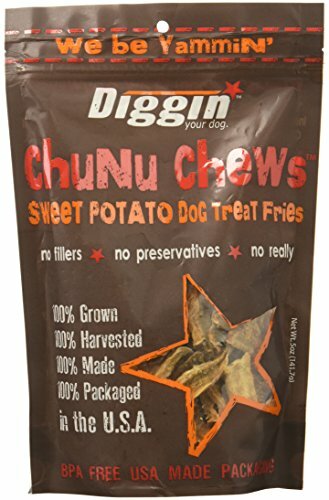 All size dogs and cats can benefit from Firm Up..
Diggin Your Dog Chunu Sweet Potato Fries - 5 oz. 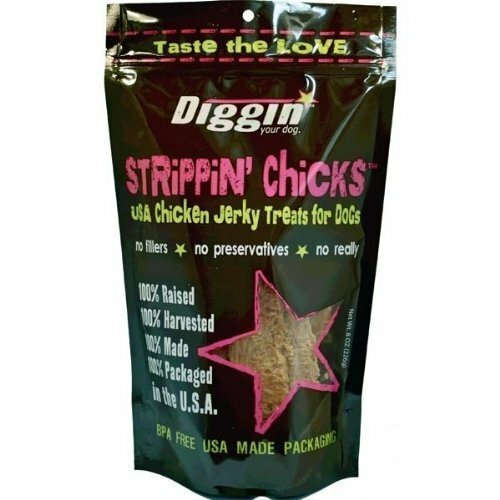 Diggin' your Dog StriPPin' Chicks 100% USA Chicken Strips 8 oz. 100% Natural USA / USDA Chicken Breast with added Vitamin E for skin and coat so your best friend will look slick and feel good! 100% Natural Chicken Breast and Vitamin E. No fillers, no preservatives, that's it! Diggin' Your Dog doesn't do "mystery ingredients". Antibiotic, Hormone Free USA Bovine Trachea and Liver.Bioavailability, 100% natural, 100% USA.An amazing tasty natural chew that supports joint, dental and mental health.Two understandable ingredients: USA Beef Trachea, USA Beef Liver.Everybody LOVES an O!!! 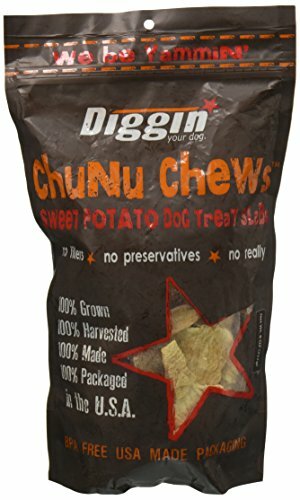 The best original Hip and Joint dog chew ever! We guarantee it. 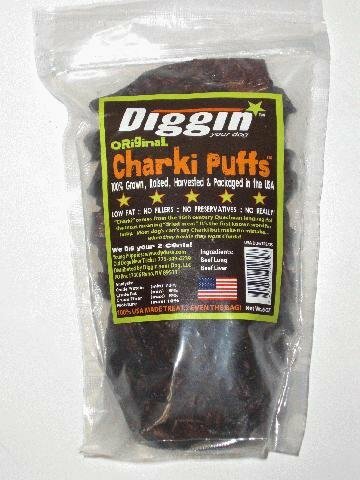 If your dog doesn’t LOVE Charki-O’s, we will refund your $$… really, they are that good!Charki-O’s are Diggin’ your Dog’s signature doggie chew. Loaded with natural, stable Glucosamine & Chondroiten Sulphate with GAG’s intact. Charki-O’s are 100% USA natural beef trachea, coated it in our proprietary liver sauce then slow roasted to a tasty, healthy chew for dogs. Dogs go nuts over O’s! “Charki” comes from the 16th century Quechuan language of the Incas meaning “dried meat”. It’s the first known word for jerky. 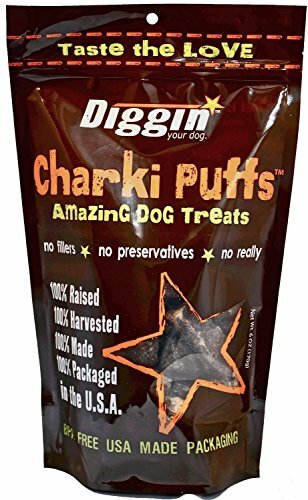 Most dogs can’t say “Charki” but make no mistake… when they barkie, they want Charki!What you do NOT get with Charki O's:- Synthetic, processed glucosamine and chondroiten sulphate.- Preservatives, additives, antibiotics, hormones, fillers.- Glycerins, Glutens, Natural Flavorings, Grain.- Phosphoric Acid, Sorbic Acid, Starch. Our Strips are 100% Natural USA Antibiotic / No Added Hormones Chicken Breast with added Vitamin E for skin and coat so your best friend will look slick and feel good! 100% Natural Chicken Breast and Vitamin E. No fillers, no preservatives, that's it! Diggin’ Your Dog doesn’t do “mystery ingredients”. 100% Raised, Harvested, Made and Packaged in the USA! 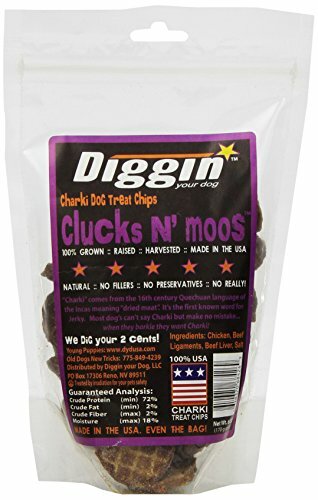 CLUCKS N' MOOS 100-percent USA CHICKEN and BEEF JERKY TREAT CHIPS FOR DOGS-100-percent USA Natural Chicken, Beef, Beef Liver. Low Fat, high protein, grain Free, 100-percent guaranteed. All natural, No fillers, No preservatives, No really. Great for any size dog. Treat chips are about the size of a quarter. 6oz Bag 100-percent Grown, Raised, Harvested and Made in the USA.